It’s been several months since the Bakersfield city school district sent a letter to parents informing them that they will not be implementing summer school this summer. That letter causing the Dolores Huerta foundation to hold a press conference tonight during BCSD’s board meeting in protest of the decision. 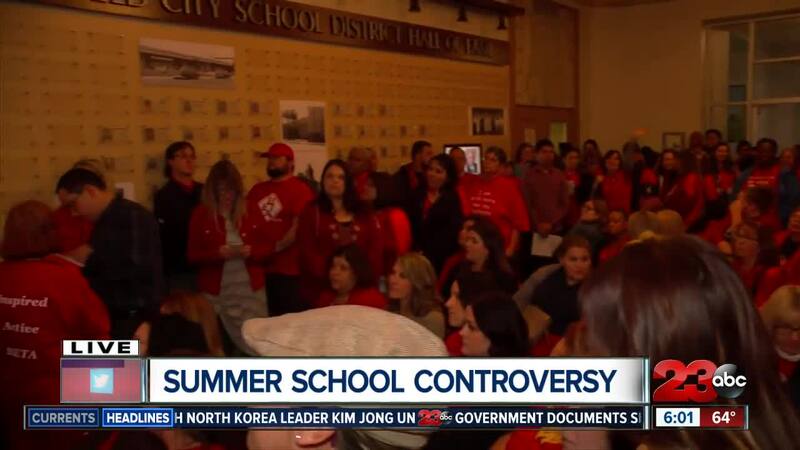 BAKERSFIELD, Calif — It’s been several months since the Bakersfield city school district sent a letter to parents informing them that they will not be implementing summer school this summer. That letter causing the Dolores Huerta foundation to hold a press conference on Tuesday night during BCSD’s board meeting in protest of the decision. A 23ABC viewer shared with us a letter from BCSD in December stating that summer school will no longer be offered for the summer of 2019. Summer school canceled for the summer of 2019 at BCSD. The letter, which appears to have been written on December 20, states “we came to this decision after considering anticipated budget reductions for the 2019 to 2020 school year." This new development may raise concerns because summer school gives students a chance to catch up on credits or retake failed classes and teachers a chance to make extra money outside of the regular school year. Currently 43 schools are under the Bakersfield City School District, most of which are elementary schools. The letter, signed by the BCSD superintendent, Doc Ervin, also says that this decision was not easy and that the school district wanted to share this information with staff early. The Dolores Huerta foundation says BCSD’s decision to eliminate summer school will negatively impact thousands of youth across Bakersfield. The school board sent parents a letter last December explaining that they will not have summer school as part of the 20-19 year citing anticipated budget reductions for the 2019-2020 year. According to the school district, the 13-day summer program cost around 1.7 million dollars, however since 2016 they’ve seen a decrease in the number of students attending, dropping from 4400 in 2016 to below 3000 last summer. Assistant Superintendent of Businesses Services Steve McClain says the city understands the foundations concerns and are looking for ways to improve summer programming. The Dolores Huerta foundation says BCSD is lacking transparency and accountability in their decision. According to BCSD, the $1.7 million goes towards 70 to 80 different educational actions. Tonight the board is not planning on addressing the summer school issue, they said that they are concerned about those 3000 students that take part in summer school programming and that’s why they are evaluating what they program will look like in the future.